Coffee Hour, after services on Sunday, is a great way for Seekers and visitors to get to know each other. 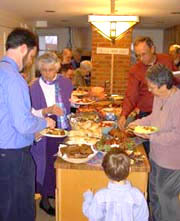 Seekers is an intentional Christian community that has grown out of the 70-year history of the Church of the Saviour. During its life, Church of the Saviour has developed a strong commitment to the priesthood of all believers; everyone has authority. Seekers has added to these traditions a commitment to shared leadership, a readiness to dialog between the faith traditions we inherited and new understandings of Christian commitment, and an invitation to all with full respect for the richness brought by people of different age, ethnicity, gender, sexual orientation, or spiritual tradition. We want to be a church for all God’s people. Read more here. In many ways, we share characteristics of the early churches started by the Apostle Paul during his itinerant ministry in Asia Minor just after the resurrection of Christ. Like the Christians in Ephesus, we come from other traditions. Like them, we have heard the stories of the life and death of Jesus, and the resurrection of Christ. Like them, we have moments when we experience the presence of the Holy Spirit. And, we often remind ourselves that, like them, we are far from perfect. Read about Seekers’ worship style here (PDF format). We begin our worship together on Sunday with community sharing, gathered in the gallery near the front door. This is a time to welcome visitors, celebrate birthdays, share the joys and sorrows of all who come, hear news about issues and activities that affect our lives, and practice the hymns we will be singing during worship. Periodically someone who has been invited in advance shares more deeply, reflecting on their spiritual journey, using “Meet a Seeker” questions (posted here in PDF format) as a guide. Some of these reflections are posted here, in the Meet a Seeker page of the website. As we shift this time of gathering and sharing toward the more formal part of our worship, we light a candle with a prayer for peace and justice, then follow it into the sanctuary to continue our worship with a time of reflection. We are conveniently located across from the Takoma Metro station. For specific directions click on the title. Our call is to be a “Seekers community” which comes together in weekly worship rooted in the Biblical faith, with shared leadership; and disperses with a common commitment to understand and implement Christian servanthood in the structures in which we live our lives. Read more here. Seekers Church, along with a number of other Christian communities, was born out of the Church of the Saviour in Washington, DC. Read more here. The life of Seekers has three major dimensions: inner journey, community building, and ministry (also called outer journey). Individuals are expected, over time, to grow in all three areas; Seekers Church aims at growing in all three areas. Read more here. The School of Christian Living meets on Tuesday evenings for a simple meal at 7:00, followed by the class at 7:45. This is frequently a place where newcomers are introduced to—and the congregation deepens its understandings of–a life of spiritual commitment. Usually we offer two classes during each six-week session, and sometimes we offer one- or two-night classes in between sessions. Click here for a current list of classes. At Seekers, the small mission group is the structure for support and spiritual accountability for living out God’s call on the life of each person. Participation in a mission group is a balance of giving and receiving. Participants are called to give themselves to the group and its mission. In doing that they receive support and affirmation for their unfolding lives as Christians. Find here links to Church of the Saviour partners’ websites, Seekers Church members’ websites, other sites with Seekers Church connections, progressive Christian networking, resources for systemic advocacy, lists of Christian communities, and communities crosslinking with Seekers Church.